Wow! It’s all here. A complete signed set of Weiss Jewelry. Brooch, clip earrings, bracelet, and necklace. It is all in amazing condition. I don’t think it was ever worn, how unfortunate! 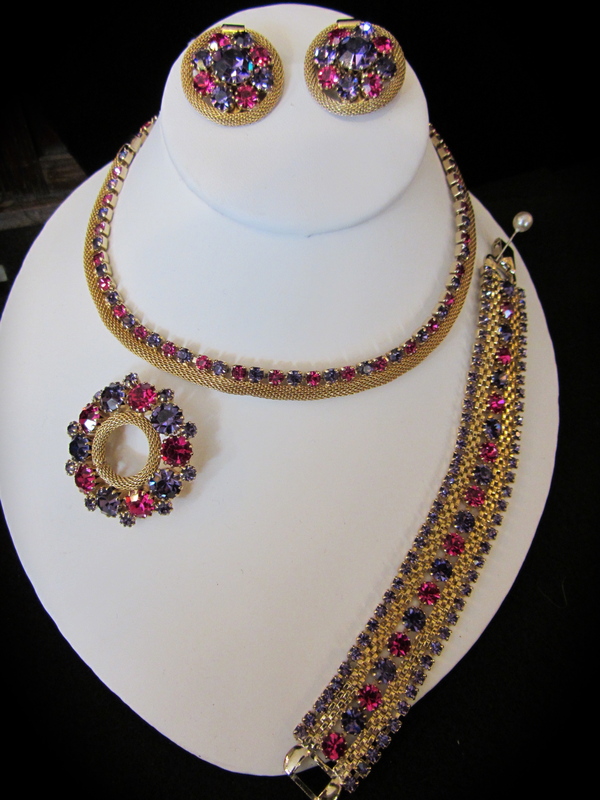 All the faceted rhinestones are all prong set. 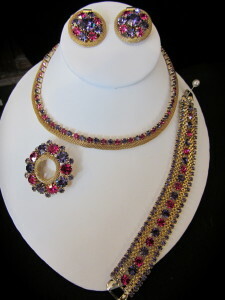 The larger round rhinestones are multi prong set or “dog-toothed”. They don’t even set diamonds this way! The necklace has a rolled mesh edge with prong set rhinestones along side it. This necklace could be worn either way. The rhinestones on top or bottom. The necklace measures 15 1/4″. The bracelet measures 6 1/2″ long. 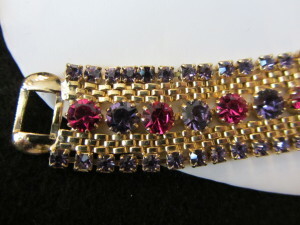 The purple prong set stones are along the outer edge and the center has larger round faceted dog-toothed stones. In between is gold tone metal. 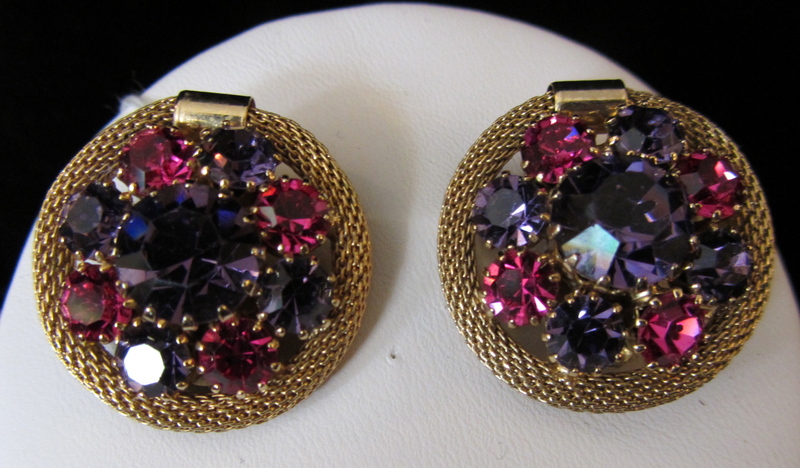 The earrings are a “button style” measuring 1 1/8″. The center stone is purple and surrounded with a fushia and purple colored rhinestones. The earrings are clips. They work well and not loose at all. 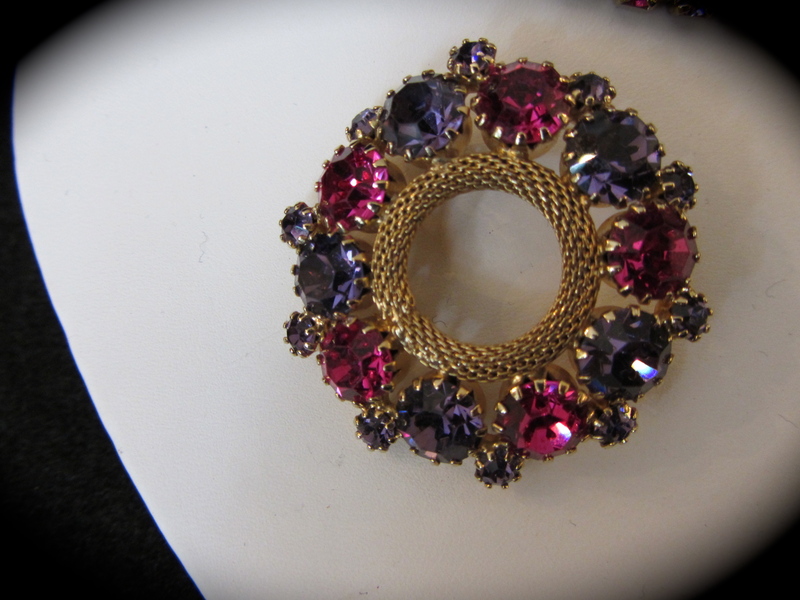 The brooch is a circle and measures 1 1/2″ in diameter. 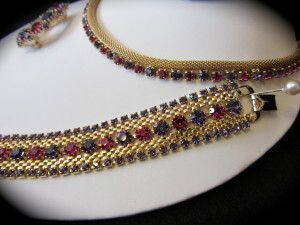 The pattern repeats with the dog-toothed faceted stones and gold mesh. All pieces are signed and show no signs of wear. The gold is all in amazing condition. Copyright © 2011-2017. Yesterday's TreasuresAll Rights Reserved.